Courage Campaign | Tell the Tribune Company: "No Sale to the Kochs"
Tell the Tribune Company: "No Sale to the Kochs"
Please check here if you currently subscribe to a Tribune paper and would cancel your subscription if this sale happens. Tribune’s newspapers include the Los Angeles Times, Chicago Tribune, The Baltimore Sun, Sun Sentinel (South Florida), Orlando Sentinel, Hartford Courant, The Morning Call and Daily Press. Spanish language papers are Hoy and El Sentinel. Stop the next Fox News before it starts. The Koch Brothers are the worst of the worst. Oil and gas billionaires, they're known for buying elections, funding anti-science organizations, union busting, dodging taxes, and twisting democracy any way they can to promote their personal agenda. Now, in a stunning move, according to the Hollywood Reporter, they want to buy the Los Angeles Times to further their radical right-wing agenda and move fringe Tea Party ideas into the mainstream. They cannot be allowed to purchase one of the most respected newspapers in the country in the second biggest media market in order to peddle their discredited ideas and right wing propaganda. Millions of Angelenos count on the Los Angeles Times for real facts, real issues, and unbiased information. The L.A. Times endorsements in local and statewide elections carry substantial clout. The Koch brothers cannot be allowed to control this vital source of information. 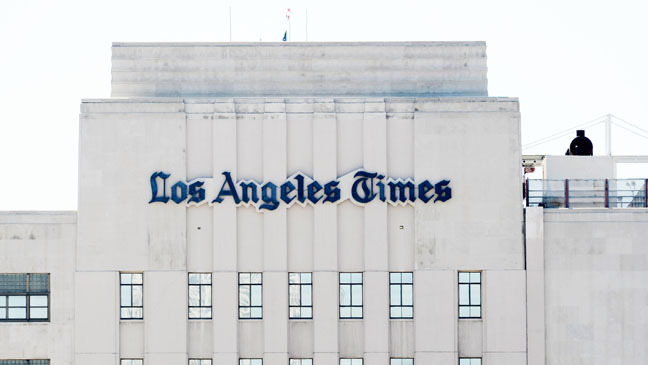 Join us in calling on Peter Liguori, President of The Tribune Company, to say "Do not sell the Los Angeles Times to David and Charles Koch, or any other propagandists."